On sale in Europe since 2006, Suzuki’s Burgman 200 is finally coming to the U.S. in 2014, completing the Burgman trifecta with the existing Burgman 650 and Burgman 400 models. To clear up any confusion, the Burgman 200 tells you its engine displacement right in clear view: the 200 is…a 200, not a 199cc, a 205cc or any other odd number. It’s fuel-injected, liquid-cooled and, according to Suzuki, focused on giving healthy mid-range power. 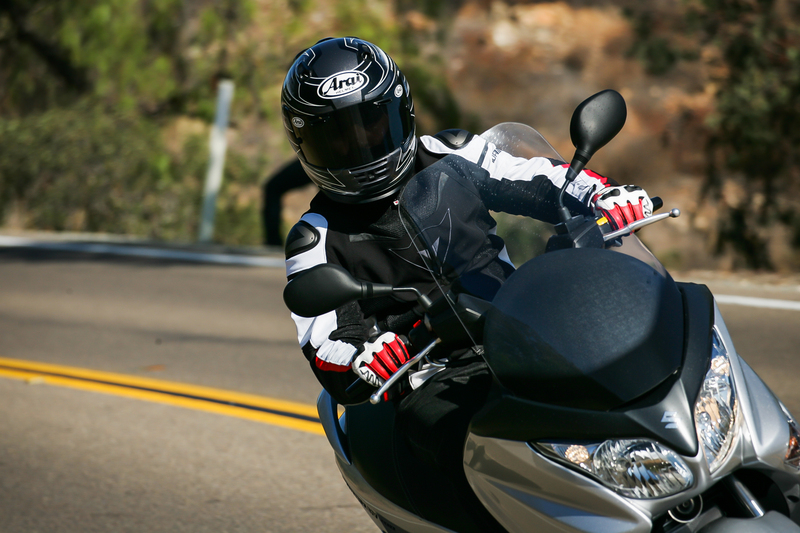 Its traditional CVT delivers the power from the engine to the tires without any shifting necessary from the rider. And yes, it’s freeway legal. 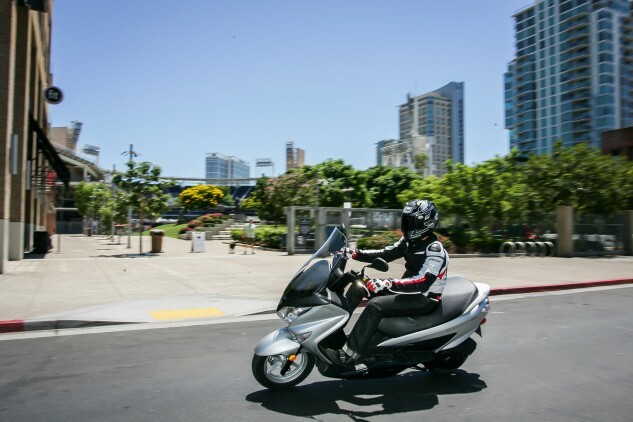 As a small-mid displacement scooter, it will appeal to commuters, students, and generally those who don’t necessarily need a car or bigger motorcycle to perform their day-to-day duties. With this in mind, the Burgman should suit these riders well. 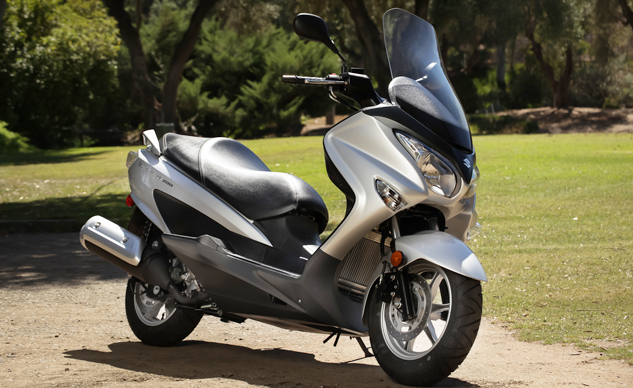 Seat height is a low 28.9 inches, one inch lower than perhaps its most direct competitor, the 153cc Honda PCX150. In addition, Suzuki says the seat has a narrow taper at the front to allow the rider to flat foot easier. The seat broadens towards the rear for more comfort while riding, and the raised footwell is a great place to stretch your legs. Assuming you’re not much taller than 5-feet, 10-inches. Got an errand to run on the other side of town but don’t want to take the car? 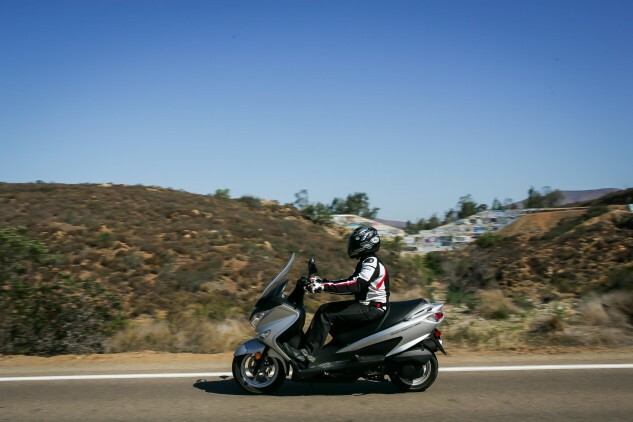 A mid-displacement scooter like the Suzuki Burgman 200 ABS is a great alternative. Despite its rather compact stature, the Burg 200 is hiding a generous 41 liters of storage space under the seat. Big enough to fully swallow two full-face helmets, a week’s worth of groceries or circus performers, this utility is the Burg’s major selling point. However, its practicality doesn’t end there. The B-200 has two additional storage compartments up front, one of which is lockable, to hold smaller items like wallets, keys, hats, garage openers or whatever else you can fit into seven liters worth of space. Conveniently, there’s also a 12-volt power outlet to charge electronics while on the go. All of the Burg 200’s attributes were put on display in beautiful San Diego, California, where our roughly 120-mile tour took us on the outskirts of town, then through the heart of the city. 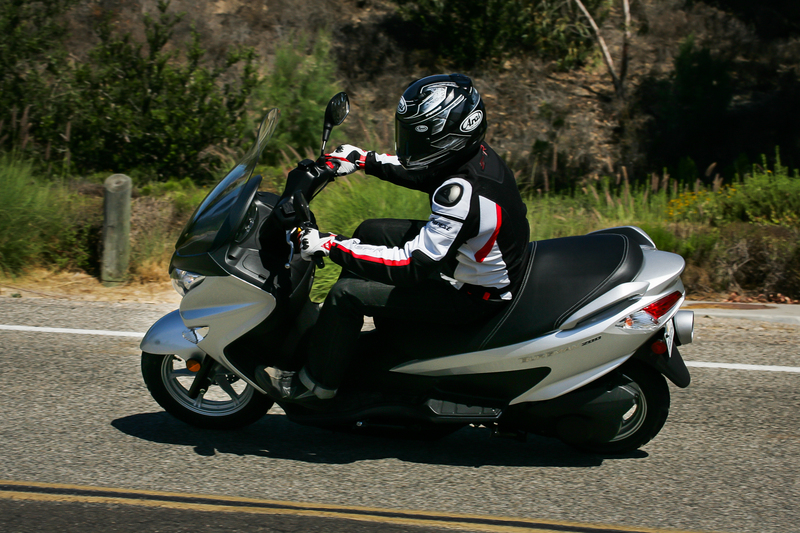 Hopping on the scoot, the seat feels comfortably padded and reach to the ground is a non-issue. At a claimed 359 lbs ready-to-ride, it’s 73 lbs heavier than the Honda PCX150, but since much of that weight is carried low, the Burg hardly feels heavy. The windscreen deflects air away from the chest area and, depending on your height, channels some of that air directly towards helmet vents. An unexpected treat on warm rides. 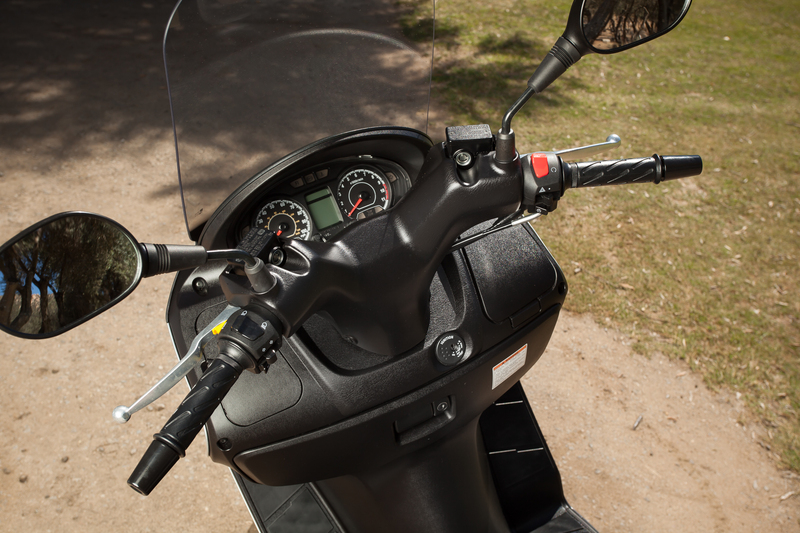 The rider is greeted to an unassuming gauge cluster with analog speedo and tach. Between the two is a digital display with fuel gauge, two trip meters, and average fuel mileage, among others. Your standard array of warning, indicator and emergency lights are also included, but the Burg also includes a green Eco light to tell you when you’re riding in an efficient manner. Seems straightforward, but during our ride many in attendance were surprised to see it illuminated virtually all the time. Personally, I only noticed it turned off when accelerating or with the tach showing 8000 rpm or higher (redline is 9500). Accelerating and spinning the engine near redline happens quite a bit on the 200, as the little Single makes its peak of 18.1 hp at 8000 rpm and 12.5 ft-lbs at 6000 rpm. However, I was pleasantly surprised how peppy — and smooth! — the little engine is. Marketing hype is always taken with a little skepticism, but the Burg-2 has plenty of grunt to evade cars in city traffic and merge onto the freeway with ease. If you want to get up to 65 mph, it’ll take you there easily. Asking for 70 mph requires a little waiting, and from there things get harder. Tucked and sitting in the draft of others, I saw 81 mph before running out of room. Throughout it all, I felt nary a buzz on the bars. That said, the Burgman is considerably vibey when sitting still. The cockpit area is rather ordinary even compared to other scooters. A digital readout in the middle is flanked by an analog speedo and tach. There’s a small storage compartment just below the right grip, and a larger, lockable compartment below the ignition key, featuring a 12v charger. View from the mirrors is pretty good, too. Clearly, the little Burg isn’t meant for speed. It’s best enjoyed just cruising and soaking in the surroundings on the way to your destination. Sit behind the bubble of the wind-tunnel-optimized windscreen and enjoy the pocket of still air in front of you. For my average stature, the top of the screen deflected air directly above my head and into the ventilation scoops of my Arai. A nice touch for this summer weather. For those scooting in colder climes, or who simply want more protection, a taller, broader screen is available to divert more air away. Heated grips are also available as an accessory. Ride quality is best described as comfortable, as the 33mm fork, twin shocks (adjustable for preload) and padded seat all provide a plush ride, though I’d stop short of calling it Cadillac-like. It’ll handle the odd twist and curve in the road, and in fact the 13-inch front and 12-inch rear wheels turn in surprisingly quickly. From there, smooth and steady is the best method for dealing with corners. It’ll wallow and protest otherwise. Thanks to the small wheels, turn-in is pretty quick. However, the Burgman prefers smooth and steady over wild and aggressive. On the braking front, the Burg is equipped with 240mm discs at both ends. A twin-piston caliper handles the front, while a single-piston unit sits in back. ABS comes standard and utilizes the same Nissin control unit used on the Hayabusa. The system works well, allowing completely ham-fisted brake grabs without drama. Unlike the PCX150, the two ends aren’t linked, allowing completely independent braking. There’s not a lot to complain about with the smallest member of the (U.S.) Burgman family. It’s a comfortable and reasonably quick scoot, and it easily swallowed my helmet and jacket during our lunch stop with room left to spare. Passenger accommodations also seem nice, as the seat is broad and well padded, with thick grab handles to latch on to. This is more of the Burgman 200’s style; a city slicker rolling through town on the way to work, school or even a date. Who wouldn’t be impressed if their date showed up on two wheels? However, two gripes stand out. First is the aforementioned buzz at a stop. It’s annoying, but once moving it completely disappears. Second is the price. At $4999, it’s a little steep for the class. The PCX150 from Honda costs $1550 less, and while it does come with a smaller engine and less storage space, Honda’s own 279cc Forza can also hold two lids and only costs $600 more than the Suzuki. Having not ridden the Forza yet, we can’t yet proclaim which is best. However, the Burgman is a completely competent scoot for its class, with plenty of power, storage and practicality to please. During our day in San Diego, my scoot’s trip computer fluctuated between 58 – 65 average mpg, despite my ham-fisted riding. It’s hard not to be impressed with that. All we have to do now is bring in the competition to see who really is king of the middleweight scooter hill. Stay tuned. 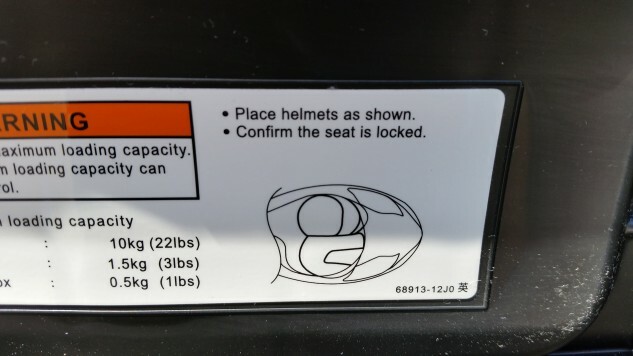 Many scooters say they can fit two helmets, but the Burgman 200 is the first I’ve seen with a diagram under the seat explaining exactly how to do it. Clever.